One of the most nutritious and best tasting wild vegetables in the southeast is called stinging nettle, botanical name Urtica Dioica. There are several subspecies of this Urtica Dioica, an there are numerous other "Urtica" species which are edible but certainly not all nettles in the Urticaceae (Nettle) family are edible, and some may even be toxic, so as long as we stick to the edible ones we will be just fine. There are actually a couple of subspecies of Urtica Dioica here in the eastern United States; Stinging Nettle, U. Dioica ssp. Dioica and the California Dioica ssp. Gracilis. 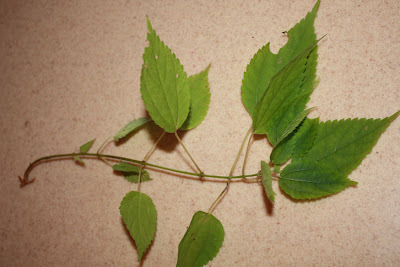 As you can see from the picture above the leaves are toothed and usually pair off in twins off the main stem. The other thing to look for is the stinging hairs on the stems, hence the name stinging nettle. Notice above that the leaves alternate with Stinging Nettle, unlike false nettle and wood nettle. Don't let the "sting" scare you away because usually after a short period of time after picking the plant wilts and the stinging sensation completely leaves, but if not it is most certainly removed by boiling, and there are really no poisonous look a likes that has these leaves AND thing stinging hairs on the stems. There is a plant called false nettle that resembles wood nettle, however false nettle does NOT have the stinging hairs but instead has smooth stems. The False Nettle in the picture above is NOT edible that I am aware of. I boiled some, just like I boiled Stinging Nettle and I can tell you that this plant produced a brown, tea like water while boiling and Stinging Nettle produced a green liquid. Stinging Nettle grows in open fields, yards, gardens, roadsides and other similar settings. 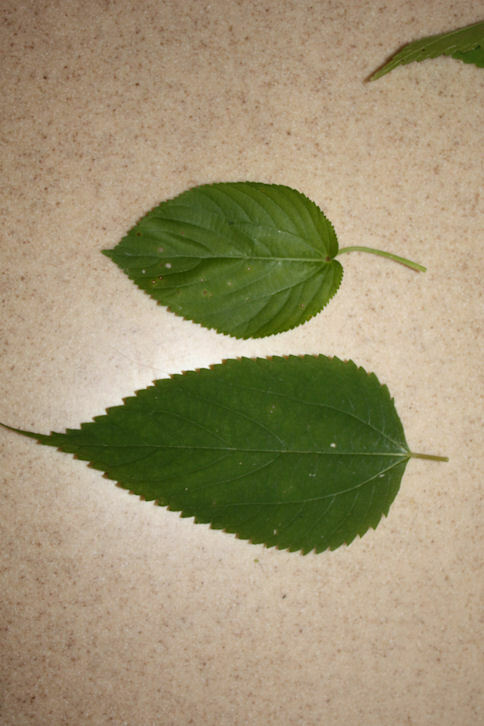 Wood Nettle and False nettle both usually grow in shaded canopies with filtered sunlight and look more similar to each other than False Nettle and Stinging Nettle. Always keep in mind to look for the stinging hairs. The leaves are completely edible and can even be eaten raw under the right conditions. Young stems and leaves can be cooked as a vegetable or steamed. Some references say to stay away from the older leaves on older plants in summer and fall because their prolonged use may contribute to developing gritty particles called cystoliths which can irritate the kidneys. The gritty particles are noticeable, and the older leaves have a much stronger taste anyway, so it won't be hard to tell what's what. It's easy to prepare the leaves, just pick off the stems. Young and tender stems can also be eaten as well, but obviously the older ones are too fibrous to eat. Stinging Nettle is very high in minerals which are easily digested, particularly iron and the vitamins A and C.
I placed a little water and some butter in the boiler to be steamed. I only steamed them for about 4 minutes. Any water that is collected is also nutritious. I sautéed some of the leaves in butter as well. I added salt, pepper and garlic. I have to admit, they were good, but a bit strong on the butter and garlic side. Half and half with oil and butter and less garlic would have been better. This plant doesn't really need much to season as they are good by themselves. There are other ways to cook this plant. The leaves can also be dried and used later in soups or in making an herbal tea called nettle tea. Nettle soup is a very popular wild soup in Europe. This is one of the top vegetables as far as taste, edibility and nutrition. It has other valuable uses as well. Leaves may be dried for winter use and were often used to make the nutritious nettle tea. Also this plant has chemical properties allow it to be used to curdle milk. The plant has been popular for making cordage over the years and also has medicinal uses. Stinging nettle most certainly does have a good flavor. Thank you for preparing some for us Sunday!